Registration will start at 16:00 – you will be able to pick up your copy of the printed programme and leather badge plus ceilidh tickets if booked. Registration will be in the bar or committee room at the Sports and Social Club or, if the weather is nice outside, on the terrace overlooking the Cricket pitch. Later in the evening there will be sessions in the local pubs, plus a larger session in the Old School hosted by members of the “Shropshire Heroes” band. The session in the Lord Nelson may also include songs – hosted by Roger Digby, Liz Giddings and Tim Normanton. The late night session will be a short walk down the road from the camping field at The Black Horse pub. The landlord has a licence until 1:30am. Breakfast will be served in the Community Centre from 9:00 until 11:00. If you would like this then you must book for it at the same time as booking weekend tickets. Full English (with black pudding if required! ), Veggie or Gluten free will be available. The first presentation will be in the Community Centre by Andy Hornby about the important Winder manuscripts. He will be accompanied by musicians to play some of the tunes. The second presentation of the day will be in the Old School at 14:00 by Sid Calderbank. His talk is entitled “A Lancashire Garland” – The history of Lancashire and its dialect over the last 500 years – bound to be highly interesting and amusing (even if you do need a translator) – not to be missed! The Community Centre will be available for a larger session from 12:30 until about 16:00, and the pubs will open about 12:00 for smaller sessions. The “flat” session will happen in the Old School (upstairs room) between 11:00 and 13:00 and a Slow and Steady session in the Old School will start about 14:00 and finish about 16:00. From 17:00 in the Community Centre, Peter and Barbara Snape will host the ECM Weekend ‘Pop-Up’ Concert Party – yes, it is ‘Tee Hee-Hee Time’ – jolly songs from times gone by to make you smile and sing along. It’s Boaters, Blazers, Dickie Bows and Pimms (all optional of course) and lots of singing! If you wish to book a slot in this planned but informal concert, please contact one of the organisers or Peter and Barbara on your arrival. As a special treat for Saturday evening at 7:30 for 8:00 we have a grand ceilidh with The Union Street Ceilidh Band with caller Sid Calderbank. Tickets are on sale for this separately at £10 each but if you are buying tickets for the ECMW you can get tickets for a discounted price of £5. Don’t forget to order yours when you are booking. Pete Grassby will host a session in the Old School from 19:00 to 22:30. And of course smaller sessions in the pubs. Late night sessions will be available in both The Black Horse and the The Wheatsheaf. Breakfast will, once again, be served in the Community Centre from 9:00 until 11:00. Sunday arrivals can register at the Community Centre from 10:00. There is an opportunity to find out more about Croston and its history with a heritage trail walk at 10:30 led by a local resident whose family goes back for generations in the village and who has amassed a great wealth of local history and artifacts. At 11:00 in the Community Centre Geoff Hughes and Peter Bearon will give a presentation about the Abram Morris Dance (from Abram – a small mining village just south of Wigan). The Abram Morris Dancers traditionally only perform on the last Saturday in June with a 7 hour walking tour of their locality taking in 20 dance spots. 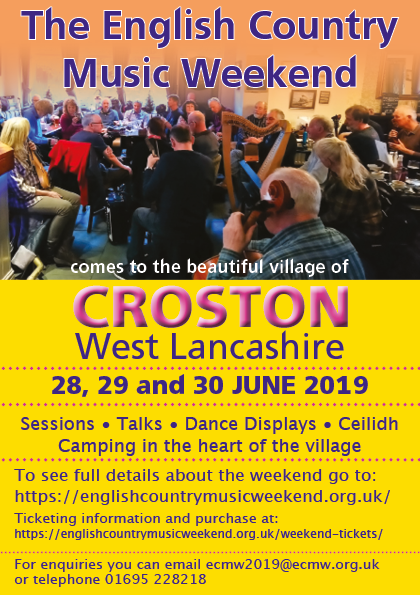 We are hoping that they will have sufficient energy remaining after all that to come and give a special performance for us in Croston. Usual pub sessions at lunch time including a session in the Lord Nelson hosted by Nick and Mary Barber. In the Community Centre Doc Rowe will talk and show at 13:00, followed by the Awards and then the final session in the Community Centre until about 16:00. For anyone who can stay (and who still has any energy left!) the weekend will conclude with a Tail Enders session. Please note this programme is a only a guide, event times and venues are subject to alteration.